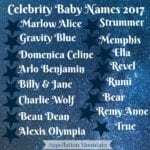 It’s time for favorite celebrity baby names 2018, and this time, I’m handing over one category to you! Every year, I come up with my picks for the most intriguing celebrity baby names. They’re the names I expect to set trends – or buck them in a way that’s just downright cool. Some of them acknowledge sibling names or family patterns. Others, I just plain love, no apologies. But lately it’s been nagging at me: what are the true crowd favorites? Where’s the broadest possible consensus that a celebrity baby name is a stand-out choice – even if the parents were just the family next door? Emilia – Take perpetual chart-toppers Emma and Emily; throw in the vintage appeal of fast-rising favorite Amelia, then add the star power of Game of Thrones’ Emilia Clarke, and this name feels like an inevitable favorite. Stanley Tucci and Felicity Blunt gave this name to their second daughter in April. Emilia Giovanna joins the couple’s son Mateo, as well as Stanley’s three older children. The name currently ranks #74, making it the most popular name in this contest – and thus, the top seed. 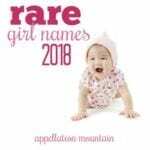 Isla – A Scottish name made more familiar in the US thanks to actor Isla Fisher, this lovely, liquid, mini name fits right in with Top Ten choices like Mia and Ava. And yet, Isla also feels fresh and new, a novel discovery for twenty-first century parents, mostly because it was seldom heard until about ten years ago. Not one, but two, celebrity couples gave the name to a daughter in 2018. Dale Earnhardt Jr. and wife Amy announced the birth of daughter Isla Rose in May. Actor Chris Klein and wife Laina also gave the name to a daughter later that month. The name currently ranks #103. Lyla – Owen Wilson became a father for the third time, this time with Varunie Vongsvirates. Daughter Lyla Aranya was born in October. She joins two brothers from previous relationships, Robert Ford and Finn. At present, Lyla tops the possible spellings of this international name. It’s also spelled Lila, Lilah, and mixes with Layla, Laila, and Leyla. That makes it a little bit Sanskrit, a little bit Arabic, and right at home with all of our short, nickname-proof choices in 2018. Lyla – this spelling – ranks #131. Genevieve – As French as Madeline, as sharp as Evelyn, as vintage as many current favorites, Genevieve fits right in with current trends. But it stands out slightly, too, a name that has never quite returned to its previous heights of popularity, enjoyed in the 1920s. Model-turned-actor Kate Upton and baseball player husband Justin Verlander gave the name to their daughter in November. It currently ranks #184. Lena – Sleek and straightforward, Lena feels timeless. With multiple possible origins, it works across language borders, too. Despite these strengths, Lena remains just off-the-radar. It made headlines this year thanks to Zara Tindall, granddaughter to the Queen of England. Zara and husband Mike welcomed their second daughter together in June, Lena Elizabeth. She joins Mia Grace. The Tindalls pronounce it with a long ay – think Layla, not Gina. In the US, the name ranks #304. Felicity – A pretty, romantic name with a virtuous vibe, Felicity spiked in use thanks to a 1990s television series, fell quickly, and then began a slow, steady climb back into wider use. Parents appreciate the name’s meaning: happy or fortunate. Reality television family member Jinger Duggar Vuolo gave the name to her daughter with husband Jeremy Vuolo in July. She’s the twelfth grandchild for the mega-family. Felicity currently stands at #347. Margot – One of the few girls’ names ending in ‘o’ that feels traditional, Margot evolved from Margaret – or really, French form Marguerite. It’s long felt stylish and quirky, a slightly offbeat name with a creative vibe. But lately, Margot’s simple-yet-modern sound has appealed to more and more parents. Actors Sam Claflin and Laura Haddock gave the name to their daughter in January, a little sister for Pip. Margot comes in at #361. Gwendolyn – A Welsh named borrowed from a legendary British queen, Gwendolyn feels ready for revival. It’s the real name of The Wonder Years’ Winnie, poet Gwendolyn B. Bennett of the Harlem Renaissance, and a 1940s and 50s-era favorite. But it makes this list thanks to actor James Van Der Beek. He and wife Kimberly are parents to five children: Emilia, Joshua, Olivia, Annabel, and the newest arrival, born in June. Gwendolyn ranks #379. Now let’s vote in the girls’ opening round. Check back later today for the boys’ contest. A match-up between two of the longer names on our list. Two short, upbeat modern names face off. Imported Lyla matches up against vintage Felicity. Paris-perfect Genevieve takes on lovely Lena. Gwendolyn is definitely my favorite – I used it 12 years ago! Margot would be the name of my third daughter, we’re i ever to have one, which I won’t. I know, right?! The first version of this included the out-there names, like Kulture + Chicago. But those were easy to see getting knocked out in the first round … this is FAR harder, LOL.